Mountain Mint (Pycnanthemum pilosum) - Also called Wild Mint, American Mountain Mint, or Hairy Mountain Mint. Native to the U.S., this mint variety is most commonly grown as a bee plant or butterfly plant. Elongated soft green leaves have a mild peppermint fragrance and can be used like ordinary peppermint. Useful for attracting beneficial pollinators to the garden and is sought after by bee keepers as an important nectar plant. 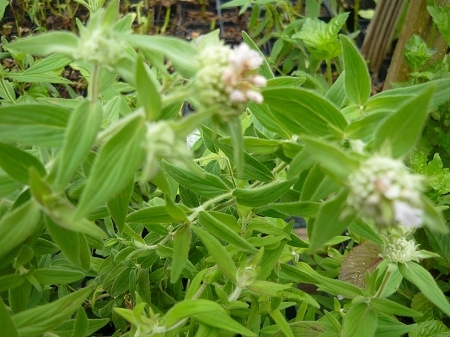 Has also gained some notoriety as an insect repellent plant and is said to help repel chiggers, gnats and ticks. Will grow 2' - 4' tall and is not fussy about soil conditions though it will perform better in well drained soil. Full sun to part shade. Easy to grow perennial zones 4-8 Live plant in 3 inch container. Not a true mint, but it smells similar to apple mint. Grows very tall and seems to stay in the general area you planted it, meaning it may not be invasive. Makes lots of flowers and attracts pollinators like bumblebees and wasps, atleast in my area, depends where you are. Grows great.